2.Static current: Less than 2mA. 3.Output signal: Electric frequency signal, high level 5V, low level 0V. 4.Sensor angle: Not more than 15 degrees. 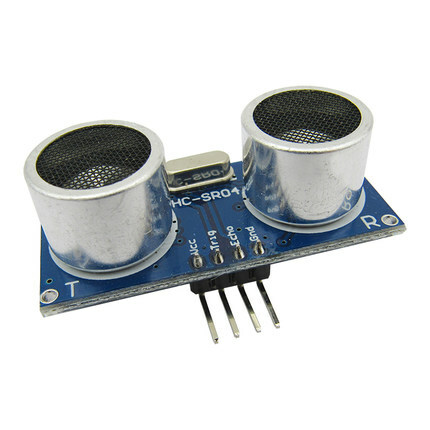 HC-SR04 ultrasonic module can offer non-contact distance sensing function, the range of which is 2cm¡ª400cm., and the range accuracy is up to 2mm; the module includes ultrasonic transmitter, receiver and control circuit. Module can send 8 pro 40 kz square wave automatically, and will test if there is any signal returned. If there is signal returned, output one high level signal via IO port ECHO. The duration of the high level signal is the time from transmitter to receiving with the ultrasonic. VCC supply 5V, and GND is ground wire. TRIG is trigger control signal input, ECHO is echo signal output. The sequence diagram above indicates that you just need to supply one 10 uS pulse or above to trigger the signal, inside the module, it will send 8 pro 40kHz round electric level with testing the returning wave. Once tested that there is returning wave signal, then it will output echo signal. The pulse width of the echo signal is in direct proportion to the testing distance. Therefore, the distance can be caculated according the duration from the sending signal to receiving signal. Suggestion: the measurement period is 60ms or above, which can protecting echo signal from sending signal. (1). for this module, keep in mind not to connect with electricity. If it is connected with electricity, you need to connect up the GND port of the module firstly, otherwise it will affect the normal working of the module. (2). When testing, the coverage of the tested object is 0.5 square meter or below, and try to make the plate smoothly., otherwise, it will affect the result of the testing. 5. Specification of the object.